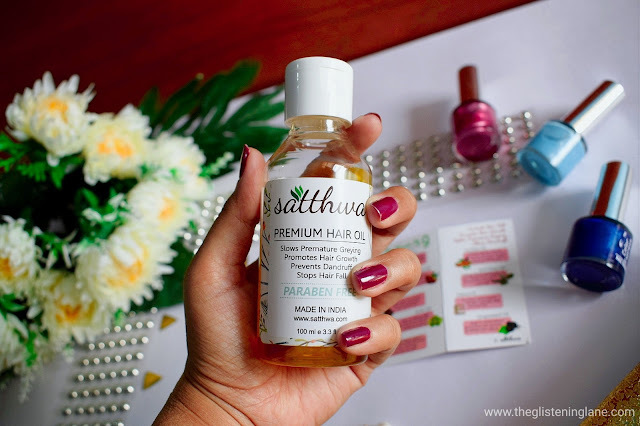 Sometime back, I got my hands onto Satthwa’s Premium Hair oil. I’m kidding you not guys, but I’ve heard quite good reviews about this oil. 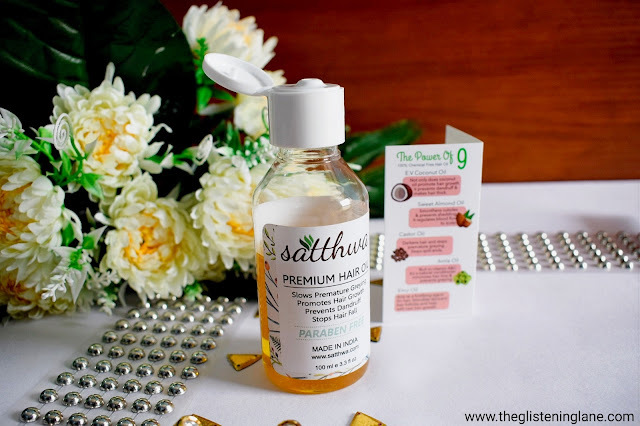 Almost every blogger swears by it & thus I was super excited to try and review it for you guys. So without more delays, let’s begin with a little intro on the brand itself. Shake well before use. Gentle heating might be required in winter. Apply oil on scalp and massage it for 3-4 minutes. Leave it overnight and wash with alcohol free shampoo. 👉Sweet Almond Oil – Smoothens cuticles and prevents shedding. It regulates blood flow to scalp. 👉Castor Oil – Darkens hair and stops premature greying. Stops split ends. 👉Coconut Oil – Not only does coconut oil promote hair growth, it prevents dandruff and makes hair thick too. 👉Grapeseed Oil – High in antioxidants, promotes hair growth and delays skin aging. 👉Emu Oil – Acts as a fortifying agent for hair. Stimulates dormant hair follicles and help new hair growth. 👉Amla Oil – Rich in Vitamin A & C. It’s a natural conditioner and minimizes hair loss as well as prevents greying. 👉Jojoba Oil – Jojoba oil has proven to be anti-fungal & unclogs pores, repairs hair and cleanses scalp. It also helps in balancing pH levels. 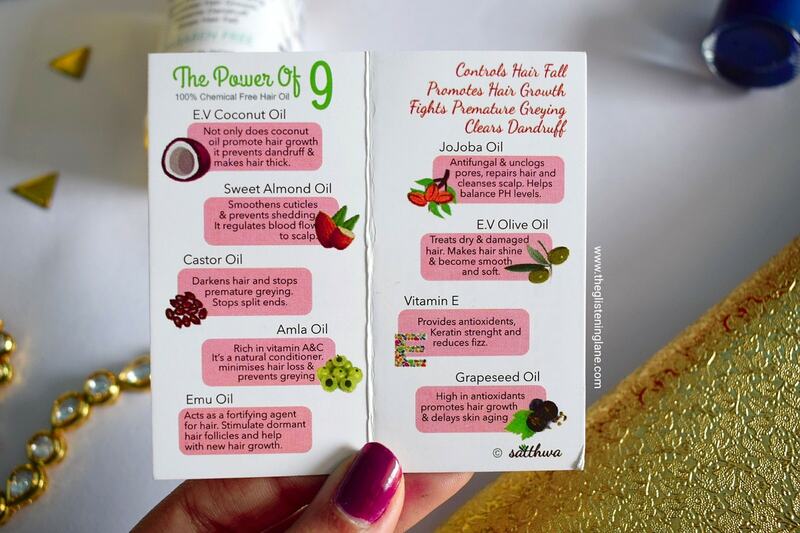 👉Vitamin E – Provides antioxidants, Keratin strength and reduces frizz. 👉Olive Oil – Treats dry and damaged hair. Makes hair shine & become smooth and soft. Buy Online: To order your bottle of Satthwa’s goodness, click here to buy directly from their official website. In case you wanna buy it from other e-commerce portals, then the links are here and here. 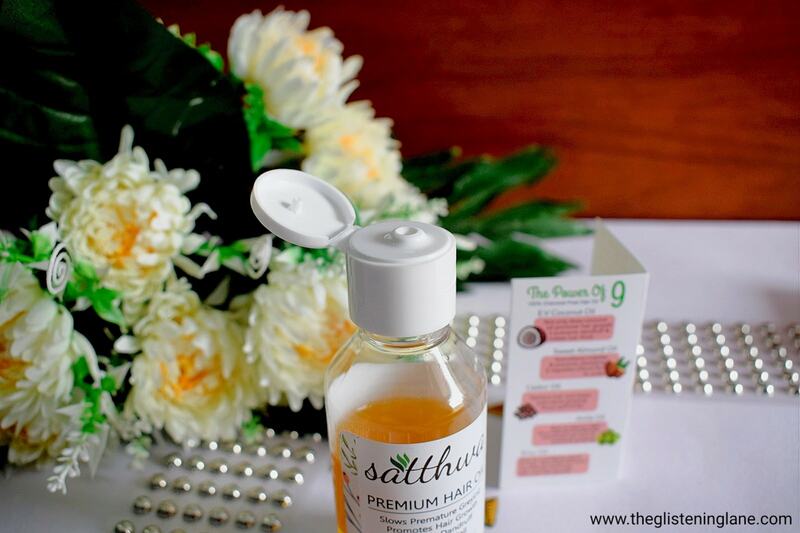 Satthwa Premium Hair Oil comes within a plastic bottle which is compact enough to be packed within your travel bag. Since it’s a plastic bottle, you don’t have to worry about it breaking or being super fragile. For dispersal of content, the bottle has a flip top open lid. The packaging speaks simplicity to me and it isn’t too fancy but I loved how the label has minute detailing of nature being captured. 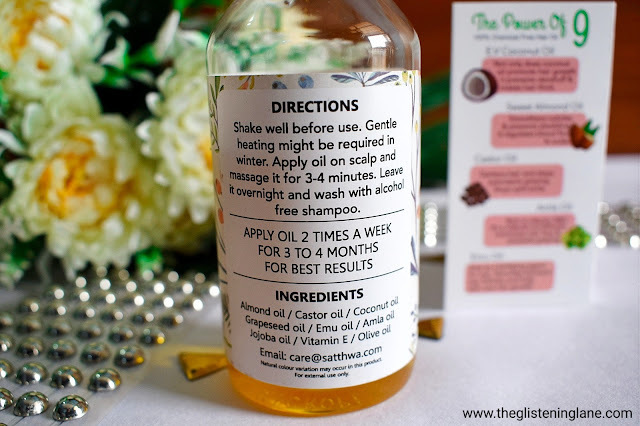 A lot of the information have been provided on the label itself but you also get along a folded information card which is really helpful for you to understand the constituents within this oil. Then my computer mind, considering itself a hacker of some kind, assumed it’s better to get your hair into a U or straight cut. Comparatively this did work, I must agree. But then I decided to get them short; so short that they now fall onto my neck (at least from one side). 😅 The other side is longer with front hair strands long while back ones kept short. Lately, I noticed a lot of hair fall. So much so that even my parents have stopped complaining about it because they know it isn’t my fault. Since monsoon, this shedding of hair didn’t stop. This is why I decided to change my hair care products. I wasn’t using hair oil on a regular basis and when I would, I kept changing my hair oil too. Although my shampoo remained the same as my father picked up the shampoo in abundance for all of us. Earlier it used to be some Homeopathic shampoo and now we’ve transgressed to another Shikakai shampoo by Khadi Naturals. 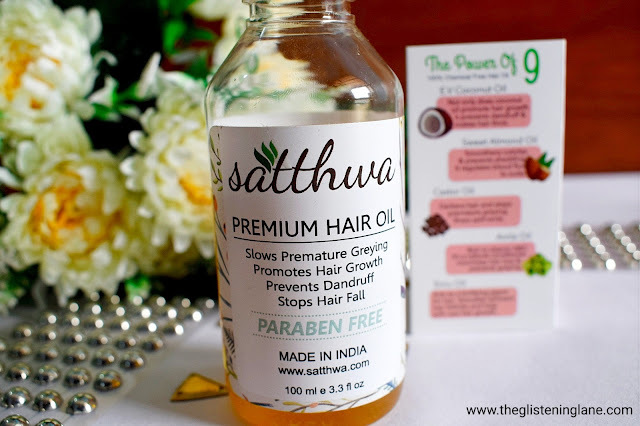 But when I got my first ever bottle of Satthwa’s Premium Oil, I read its label which said to use an alcohol free shampoo after hair oiling. Now that I’ve stopped applying oil on a regular basis, it was visible onto my hair; consistent hair shedding and reduction of volume, all that jazz happened. 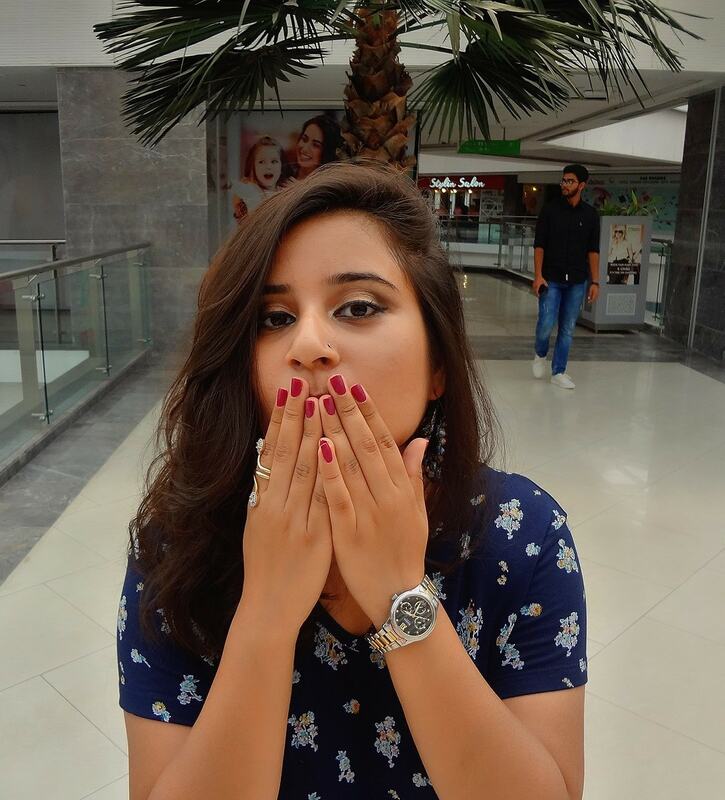 Initially, messy wavy & textured hair adopted to hide that flaw and few years later – “Short Hair We Don’t Care” became the motivational quote! When I received Satthwa’s Premium Hair Oil, I knew it’s time to stop being super busy and move further the traditional manner. As I told you before, alterations for shampoo too have been adopted and I made sure to waive off my farewell to chemically loaded shampoos. This premium oil is supposed to be kept overnight but an experimental me left it for different intervals to see the outcomes. For the first time, I applied it directly onto my scalp and a little onto the length (which in my case isn’t much). And since my mother had white pillow covers on that day, applied early morning and washed it off after 4 to 6 hours. I washed it off with Inatur’s Tahitian Monoi Oil Nutri Repair Shampoo but skipped onto a conditioner because oiling leaves my hair smooth usually and I dreaded excess moisture and limp hair. It left my hair a little hydrated and they weren’t frizzy but not too smooth. Possibly, that must be because the shampoo I used unfortunately had alcohol in it. 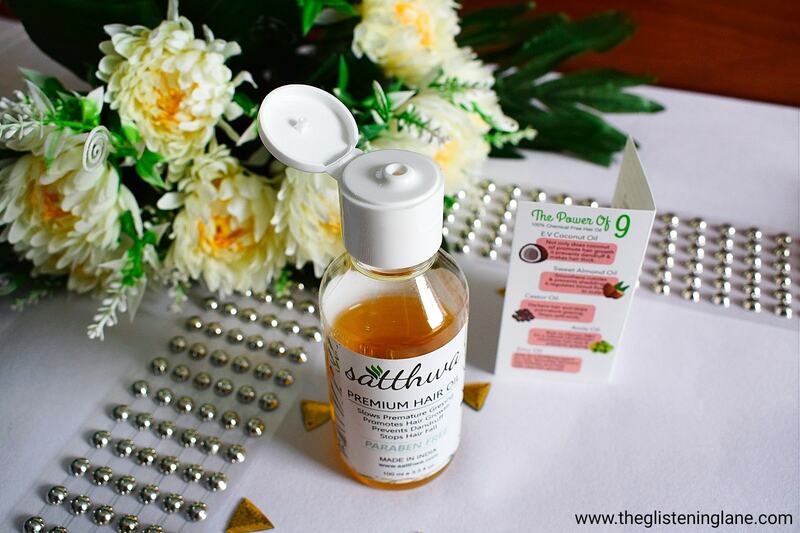 So next time I kept my oil overnight and opted for an alcohol free shampoo – WOW Skin Science’s Apple Cider Vinegar Shampoo. And this time, the results were much apparent than before. Thankfully, no volume less hair and yet hydrated tresses. This time, I also noticed my hair fall reduced to some extent. But it didn’t vanish completely. Do I intend to re-purchase this? Definitely! Making a concoction of different hair every time you decide to oil your hair would be a hassle. So this is a must have hair care product for me from now on! If granted a chance, would I like to change any aspect of this product? May be the price point because it’s a little expensive for a bottle of hair oil. 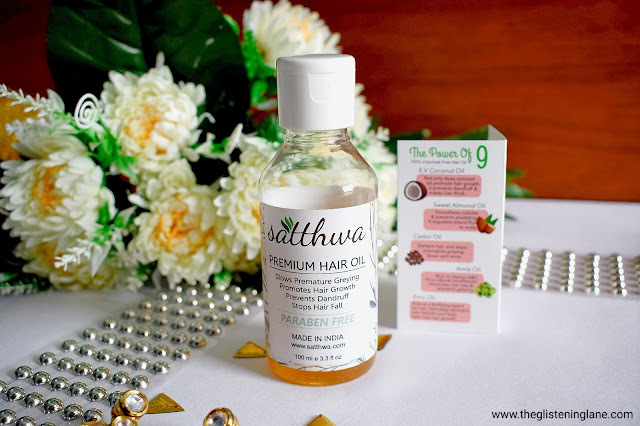 What I love the most about Satthwa’s Premium Hair Oil? It helped in reducing my hair fall to an extent and with nutrition to my hair roots it does not leave my hair’s volume with crutches!